Surviving in Salt- and Fresh-water? If the salinity of the ocean is constant, is the skin of salt water fish more permeable than fresh water fish so that salt water fish do not have to regulate their body sodium? How do salmon cope in both fresh water and salt water? Osmolarity describes the concentration of solutes in a solution. The problem that marine and freshwater fishes face are really two sides of the same coin. With freshwater fish there's a for salts to move out of the body leading to bloating and loss of salts. For marine fishes there's a tendency for water to move out of the body, leading to dehydration and excess salts. The most obvious trick to cope with these problems is to place a barrier between the insides of the body and the environment outside. The skin of the majority of fishes, both marine and freshwater, is relatively impermeable for water. Fish do need some permeable surfaces for respiration and water still moves between their tissues and the external environment. Freshwater fishes avoid water gain by not drinking and producing large amounts of urine. Marine fishes avoid water loss by drinking and producing small amounts of urine. In addition to these mechanisms fresh water fishes use their gills to absorb salts and marine water fishes use their gills to secrete salts. 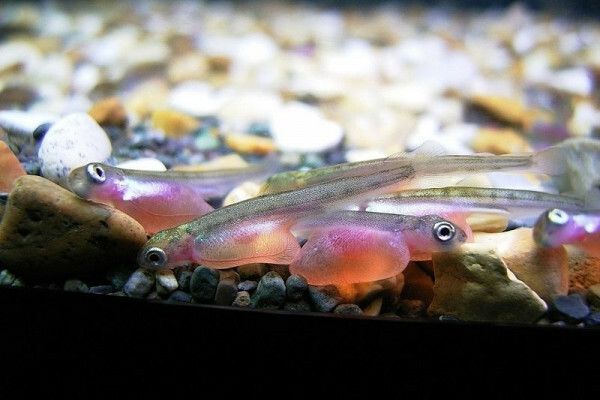 When salmon and eels migrate between freshwater and the sea there's a change in the cellular structure of their gills which enables their gills to start secreting salts just like a normal marine fish. All bony fish have to osmoregulate and since they first evolved in the sea it might appear that this would be easier for marine fishes but this is a bit of a red herring. Previous What are alternatives to carbon dating? Next Why does the sound of nails on a chalk board get such a physical reaction from us?